Since it only takes an hour and a half, Hakone is well‐known as a resort for a day trip, where they can enjoy the nature including Mt. Fuji and Ashinoko Lake, museums, and foods. 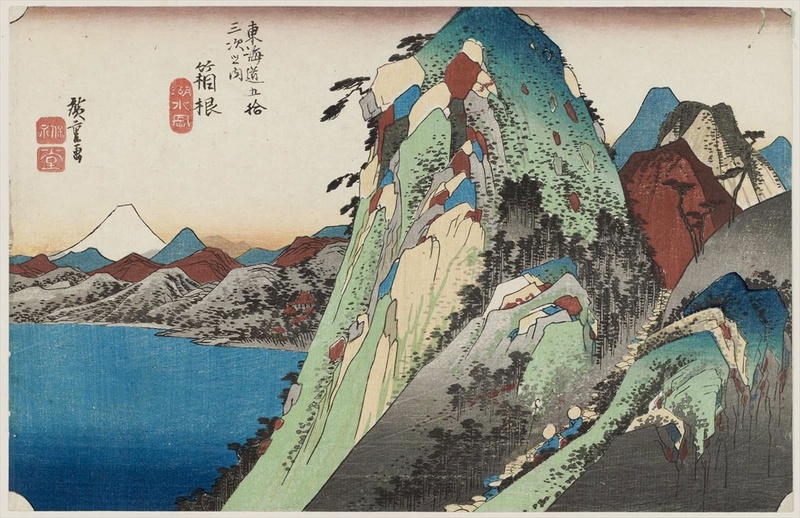 The Edo ukiyo-e artist Utagawa Hiroshige drew the landscape of the picture of Mt. Hakone and Ashinoko Lake. But Hakone is also famous for a hot spring district and have many accommodations, like Fujiya Hotel established in 1878. Though there are the reasonable inns, you can find the luxury ryokan with wonderful rooms, dinner, and rotenburo (open-air bath) in the long-history hot spring area. I would like to introduce the 10 high‐class ryokan hotels with onsen. Some ryokans are famous even over the sea, and others get high reputation in Japan. Booking is possible on each site or phone. All of the 23 rooms are suites and have open air rotenburo. The rooms have each feature such as the mist sauna, hammock, or Japanese style with the tatami. One of the architectures of Suishoen is designated as the tangible cultural properties from the nation. You can choose the dinner from Kaiseki ryori (traditional Japanese multiple course meal) or Teppan-yaki (grilled dishes). Adress:519-9 Kowakidani, Hakone-machi, Ashigarashimo-gun, Kanagawa Prefecture. The scenary surrounding Hakone Ginyu is just the Japanese nature. The mountains of Hakone area and Hayakawa River change their appearance at each season. Surpprisingly, most of the floors in the building are tatami mats. You can deeply feel the Japanese atmosphere. You’ll have the breakfast and dinner in the room. They change the menues of Kaiseki ryori every month for serving seasonal ingredient. Their esthetic spa won the TOP 10 SPA of JAPAN in 2017. Booking is only accepted by the phone. Adress:100-1 Miyanoshita, Hakone-machi, Ashigarashimo-gun, Kanagawa Prefecture. Washintei Hougetsu received the award of TripAdvisor TRAVELERS’ CHOICE in 2016. Though the modern style Kaiseki ryori and traditional Japanese rotenburo are selling points, the hotel puts more importance on “family”. They help to celebrate a memorial day for customers and offer OMOTENASHI for a family trip. Especially, the plans for a parents with the baby, and pregnant woman are really great for them. Adress:90 Motohakone, Hakone-machi, Ashigarashimo-gun, Kanagawa Prefecture. Compared with Hougetsu, Kinnotake Tonosawa focus to keep the fancy and calm atmosphere. So, a minor couldn’t stay the ryokan. Their creative Japanese cuisine is one of the drawing cards. Especially, five-star Rice Master Tsuchiya Hajime makes the strict selection of the rice for the cuisine. Of course, all rooms have open-air bath. And they have the optional plan for an anniversary including the special champagne, sliced raw lobster, and fancy cake. Adress:191 Tonosawa, Hakone-machi, Ashigarashimo-gun, Kanagawa Prefecture. In 2014, Gora Hanaougi got the top positions in 164 ryokan hotels enlisted in TripAdvisor. Like Hakone Ginyu, you can walk on the tatami‐floor in the buildings without shoes. The appearance of the buildings are not only the traditional Japanese style but also modern design. The natural woods of the rooms and lobby emphasizes the luxury Japanese atmosphere. And not a few people look forward to having the dinner with Hida beef. Adress:1300-681 Gora, Hakone-machi, Ashigarashimo-gun, Kanagawa Prefecture. Since Madokano-mori is in the same group of Gora Hanaougi, you can enjoy Hida beef at the ryokan. But the sashimi dishes are the more attractive in their dinner. The chefs cook the fresh fishes unloaded at Sagami Bay on each season. The architectures are more Japanese style than Hanaougi. And you can see the scenery of Gora from all the rotenburos at each room. Adress:1320-862, Gora, Hakone-machi, Ashigarashimo-gun, Kanagawa Prefecture. The land and buildings of Gora kadan were the estates of Prince Kaninnomiya Kotohito. After the WW2, the founder of the ryokan hotel received the properties and started the business. In 1997, the ryokan joined the Relais & Châteaux. The detached rooms are surrounded the garden which the Imperial prince owned. Since even the waitresses don’t come near the rooms except you need, they are almost the private space. As for the hot spring, the ryokan has three sources. They have the good effects on cold-sensitive and fatigue. Adress:1300, Gora, Hakone-machi, Ashigarashimo-gun, Kanagawa Prefecture. The foundation of Senkyoro was in 1870. One of the long-history ryokan in Hakone. There are some types of the rooms such as with the rotenburo or more spacious. But all of the rooms are purely Japanese style. The Kaiseki ryori cuisines are mainly seasonal fishes. And they set various local sake and shochu (Japanese distilled spirit). Adress:1284 Sengokuhara, Hakone-machi, Ashigarashimo-gun, Kanagawa Prefecture. Actually, the number of the rooms of Kitanokaze Saryo is just 10! It means that each room is spacious and their hospitality is so courteous. The rooms have the rotenburo or viewing bath. If you wish to spend calm time, the ryokan is best for you. They use the foodstuff from Hokkaido and the local area. You can choose the kind of fishes for the dinner. And there are also a lot of sake from Hokkaido. A child of 12 years old or younger couldn’t stay the ryokan. Adress:934-29, Sengokuhara, Hakone-machi, Ashigarashimo-gun, Kanagawa Prefecture. There are many bamboos in all 10 rooms. You can soak in the world of the famous Japanese fairy tale. As belonged to the same group of Kinnnotake Tonosawa, the high-grade rice are used for the cuisine too. Adress:817-342, Sengokuhara, Hakone-machi, Ashigarashimo-gun, Kanagawa Prefecture. This entry was posted in travel and tagged Hakone. Bookmark the permalink. Masterpieces of Japanese Culture > travel > Best 10 luxury ryokan in Hakone. The traditional hotels with hot spring!